Leaders with moxie are those with the courage to be counted, the get-up-and-go to take action, and the desire to garner recognition for their teams as well as themselves. In MOXIE: The Secret To Bold And Gutsy Leadership, internationally recognized leadership expert John Baldoni shares the stories of leaders from all walks of life, including business, politics, sports, and the arts, and explores how they exemplify moxie. MOXIE shows how leaders can combine thought and action to take themselves and their organizations to new levels. Leaders with MOXIE burn with a desire to make something good happen. They are ambitious and willing to sacrifice for long-term gains. Leaders with MOXIE know how to pick themselves up after a defeat. And those with MOXIE can read people and situations in order to know how and when to execute for results. The word M-O-X-I-E also serves as an acronym for Motivation, Opportunity, an “X” factor, Innovation, and Engagement that work together for success. MOXIE is a concept that the modern leader is wise to adopt—one part courage, one part can-do spirit, and one part recognition. 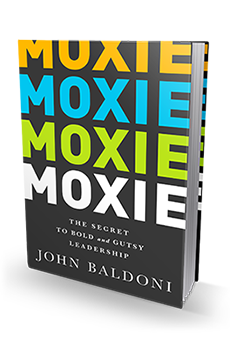 In MOXIE: The Secret to Bold and Gutsy Leadership, John Baldoni uses concrete, tried-and-true steps to bring out the inner leader in everyone. For management and employees alike, MOXIE provides a roadmap to inspire innovation and effective leadership. Whether you’re already at the helm of your organization or still looking for a way up the ladder, MOXIE is the leadership tool you can’t do without.